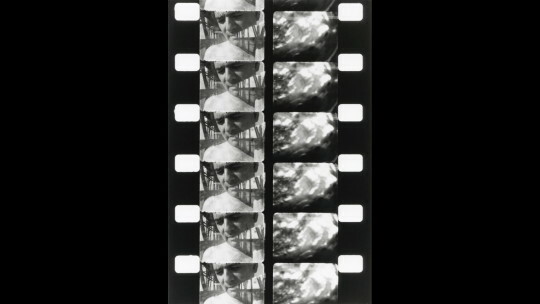 The new York Film Festival is doing a complete retrospective of the work of Nathaniel Dorsky and Jerome Hiler, though even the members of the press who are fans of theirs are hard pressed to know why it's being done at NYFF and not Anthology Film Archives. Even with the Projections sidebar (Formerly the View From the Avant Garde) this is a bit extreme. Before the screening someone from the Film Society came out and told us that the films would have a minute of blackness between them. I suspect that was because with out it the films would look like one long mish mash, The films (TRISTE, VARIATIONS and 17 REASONS WHY) are series of single shots, often beautiful framed, a couple of seconds each with absolutely no sound. I know that the images are supposed to line up thematically and echo and rhyme with each other but a little goes a long way. 17 REASONS complicates things by having four similar images on screen at the same time with each slightly out of sink. I was fine on TRISTE, but grew weary during VARIATIONS and near apoplectic during 17 REASONS. This wasn't experimental film, this was mind control and torture and a violation of most of Geneva Conventions rules against human rights violations. Walking out I spoke to two Film Society staff members(who shall remain nameless) and they were shocked I didn't like the films. I replied one film would have been fine but four in row was too much. Pausing to think both of them remarked I might have been right since while they were fans of the director they had never seen more than one film at a time. As we talked another member of the press wandered out and started to talk about how much she hated it as well. She also said by her count 17 people had walked out before her. Walking across the street ran into a member of the press who was at the screening and had left early because he had a call he had to make. He was a big fan of the director and is going to be doing a big piece on the sidebar. He was shocked that I hated the films. As I explained one film was fine, but more than that was pushing it. He started to tell me how much he liked the films and what they meant... and then he stopped dead and looked at me and said that he suddenly understood my problem "You know, I've never seen more than 2 of his films back to back ever. I don't think you really can..."
Had it been one film or two in a series with other films I would say give it a go for the adventurous but for the thought of an hour or more of repetion of style and image is too much for the human mind to bear. The series is currently running at NYFF and should be avoided.